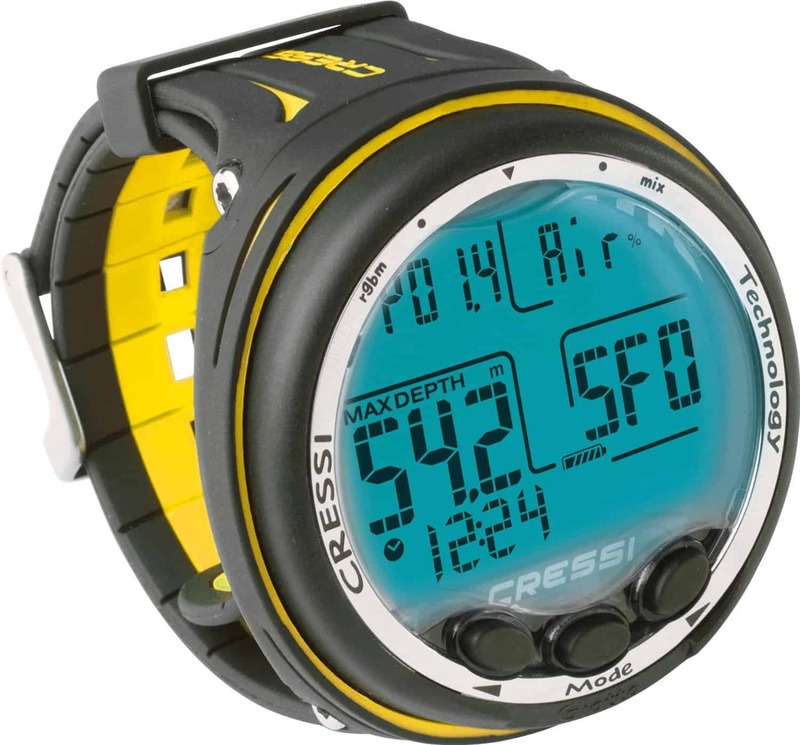 Cressi introduced the new Goa dive computer earlier this year. It’s a wrist watch sized device that comes packed with functionality. It’s not available yet in the US so we evaluated the technical specs as they are available at this time. Based on that information it seems like you’re looking at similar features as in a Cressi Leonardo that is sized as a watch that you can wear every day. For the beginner and recreational diver. Wrist watch sized to be worn every day. Simple two button navigation allowing quick menu access. Reasonably priced for the features it offers. ​The Cressi Goa is a very compact scuba wrist computer where most of the features match the Leonardo. You’re ​looking at a great dive computer for beginners and recreational divers. Many divers never require the missing features like air integration or a compass and as such this might just end up being the only one you ever get. ​CLICK NOW for more information! 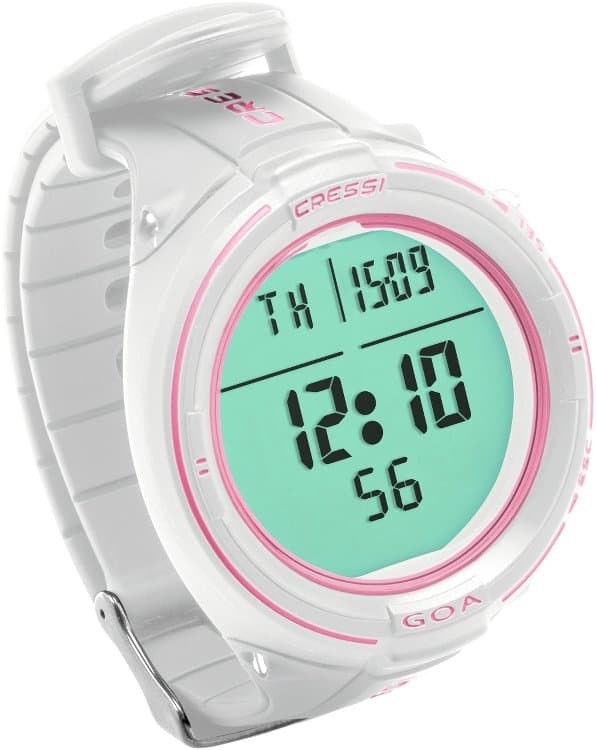 The Cressi Goa is available in a number of color combinations: black, black/grey, black/blue, white/pink and white/grey. You'll be able to find a stylish color combo that you can wear every day. The Cressi Goa has a diameter of only 48 mm making it a great size to use and wear as an everyday watch. It features a high contrast display with large numbers to make it easy to read under any circumstance. As you would expect, the display is backlit for dark environments. The time can display in 12/24 time format and it has a calendar function. Navigation on the Goa is managed through two buttons on the side. The navigation is easy and straightforward. A great feature included in the Goa, similar to the Leonardo, is that the computer can be completely reset. This makes it a perfect device for dive shops as they are able to perform the reset between different divers. At that moment no dive history is in the memory anymore and the calculations for decompression, etc. start from zero. 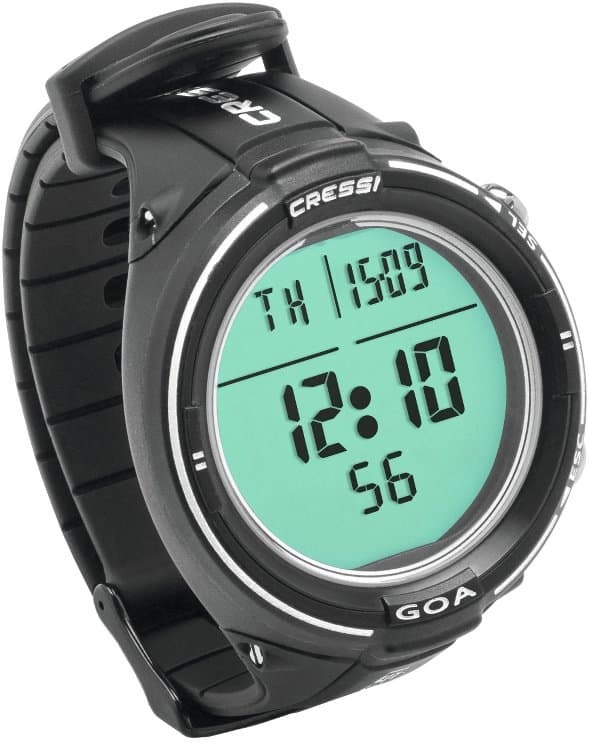 The Cressi Goa can handle Air and Nitrox diving. You can switch between nitrox and air during desaturation. The operational max. depth is 120 meters/393 feet. Additionally, the Goa provides altitude adjustments. It also includes no fly time calculations as well as a surf time and a desaturation calculator. The algorithm used is Cressi’s RGBM. It can be adjusted for different conservatism settings. Cressi’s algorithm has a long history and is proven to be safe and sound. The dive log is reasonably large. You can keep dive data for the last 50 dives for each category. So, you can save 50 air dives, 50 nitrox dives, etc. That’s plenty of capacity to store data on the dive computer itself. If you are a beginner or a recreational diver without the need for multiple gases then this could very well be the dive computer for you. If you are already considering switching to technical diving then this will not be the right device for you. It’s not to be expected to have air integration for a dive computer in this category. It is also not necessary to have it. It’s pushing the price point up a lot to have wireless air integration and it quickly becomes uneconomical for most divers. A built-in compass is also a nice-to-have feature that is missing. 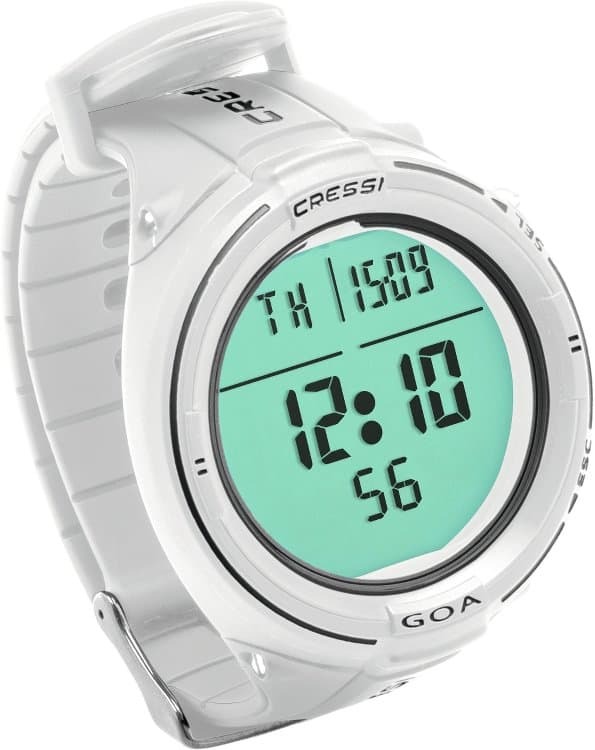 However, assuming you have a console with a compass and a pressure gauge does already take care of both of the missing features for the Cressi Goa. The Goa does have the features you’d expect from a recreational dive computer. Judging the features based on the Leonardo, you’ll be able to get a great dive computer for the money. In the case of the Goa you even get more features in a smaller package for some more money. ​The features match at least the functionality that the Leonardo provides. This alone ensures that ​you get a great dive computer. The couple of missing features are nothing you'll be missing in a scuba computer in that price range. The Goa ​is available for purchase online. As with any purchases you will usually find that Amazon is one of the best places to get any of your dive gear including the Cressi Goa​. In addition to the best pricing you also typically have the widest selection of different colors on there. Another advantage of Amazon is that you can get free two-day shipping if you are a Prime member. It’s also easy to return or exchange products if they’re not what you expected or if they’re not working. The comparison chart below shows the differences between the Cressi Goa, the Cressi Giotto and the Suunto Zoop Novo. Whom is the CRESSI Goa not for? ​If you are into technical diving then you will need features that the Goa doesn't offer. 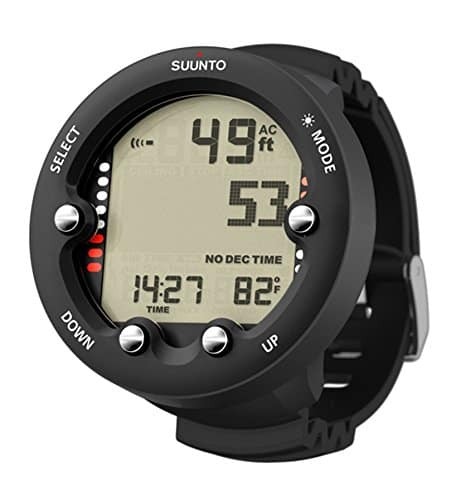 You might want to consider looking at the Suunto Vyper Novo in that case as a great choice.